F ila sneaker model, Disruptor II is one of the most popular sneakers in the brand’s long line of trendy footwear. 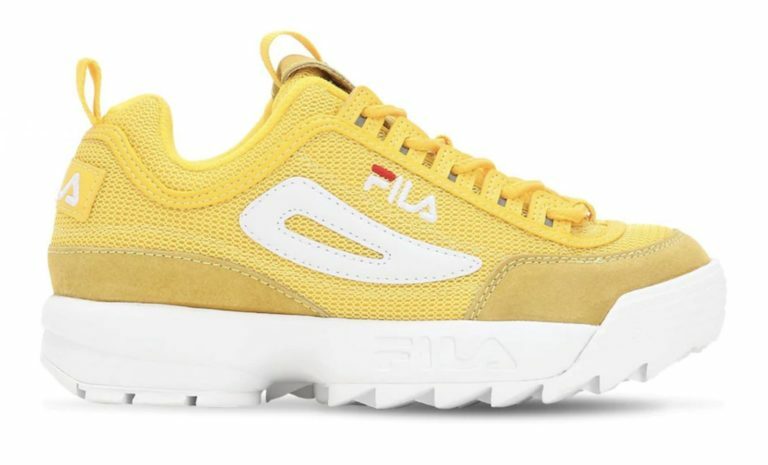 The story is much more than just hopping on the latest trend based on the brand’s longevity in the athletic and fashion world, it’s safe to say that the re-emergence of the brand with Fendi placed FILA in one of the best positions this side of the street. The leather Disruptor, sneaker took the streets by storm at an affordable price which placed them at an advantage to the average not so average fashion forward consumer. But soon the leather version of the popular dad shoes will take a back seat to the new and improved mesh version. The original model is seeing a remake with a lighter mesh material release as well as a new much needed brighter colorway that emphasize that time of the year. The lighter yellow & pink release maintains the original silhouette of the dad shoe phenomenon catered specifically towards an entire demographic of trendy women. While the former leather release is seeing the sales rack, the newer mesh release will see top shelf $150 release at retailers. Both colorway, maintains a darker toned suede overlay that wraps around the toe and heel, while the shoe retains its signature rugged outsole. There are more pictures after the JUMP!